Welcome to Thiva Exim. 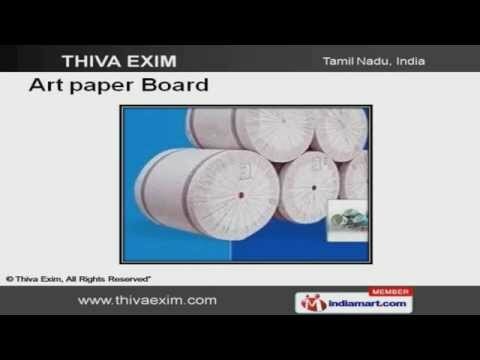 Exporters and Suppliers of Paper and Boards. The pany was incepted in the year 1971. Our advanced technologies and international quality standards make us unique in the industry. Ethical business practices, Transparency business dealings and Maximum client satisfaction are the plus points of our organization. We offer a huge gamut of Paper, Poly Films, Wood Dust and File Boards. A 4 papers offered by us are in huge demand across the global markets. We are instrumental in offering a wide array of Art paper Boards at cost effective prices. We also provide Craft Papers that are reckoned all over the world for their superb quality. We bring forth a wide range of News Print Papers that are widely demanded in the market. Along with that we offer SBB Boards that are acknowledged for their durability.